As hoped, things are going wonderfully with Zeus. He and my other rabbit have free run of their own room, complete with tunnels and fun things to climb on and hide in. Every time I come in they both zoom right over to me and assume the "please start petting us now" position. If I sit down I soon have two very large bunnies in my lap, nudging impatiently for ear massages and in Zeus' case, nose rubs. He actually likes to have his whole face massaged, and will practically fall asleep while you do it. Zeus is everything I had hoped for in a second rabbit and has meshed flawlessly with our family. He is extremely outgoing and so sweet and very social. It fills my heart with joy just to watch the big lug play. I think one of the biggest highlights of my evening is when my BF and I go hang out in the rabbit room and get to snuggle with them play games ("who can toss the paper tube the farthest" is a popular one right now!) I can't thank you enough for saving him and for giving me to opportunity to bring him home, he is truly a blessing. "As hoped, things are going wonderfully with Zeus. He and my other rabbit have free run of their own room, complete with tunnels and fun things to climb on and hide in. Every time I come in they both zoom right over to me and assume the "please start petting us now" position. If I sit down I soon have two very large bunnies in my lap, nudging impatiently for ear massages and in Zeus' case, nose rubs. He actually likes to have his whole face massaged, and will practically fall asleep while you do it. Zeus is everything I had hoped for in a second rabbit and has meshed flawlessly with our family. He is extremely outgoing and so sweet and very social. It fills my heart with joy just to watch the big lug play. I think one of the biggest highlights of my evening is when my BF and I go hang out in the rabbit room and get to snuggle with them play games ("who can toss the paper tube the farthest" is a popular one right now!) I can't thank you enough for saving him and for giving me to opportunity to bring him home, he is truly a blessing." Hi! My name I am a very unusual looking rabbit with my super long ears! 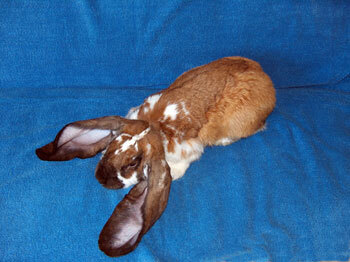 I am a purebred English lop bunny, and we are bred to have these extra long ears. As you can imagine, from a rabbit's perspective having these long, floppy ears is sort of a dopey idea, because while they look cute, they aren't very functional. They sort of get in the way sometimes. Oh well, humans sometimes have odd ideas about breeding animals. Anyway, I wanted to tell you that I am looking for a fabulous, permanent home where I will be adored for who I am and not just what I look like. In addition to being a spectacular looking bunny, I am also very loving and sweet. I really enjoy getting a lot of attention from people and love it when people talk with me and stroke my head. I arrived at the shelter as a stray, so no one is quite sure how old I am, but I look like a middle-aged sort of fellow. I have the best of both worlds---I have the maturity of an adult rabbit along with a nice, moderate activity level. I'm quite a special guy in so many ways. I'm neutered, vet checked and a wonderful rabbit looking just looking for true love. Please visit me soon.